"If paper invitations are a must for whatever reason, check out Paper Culture, where cards are made from 100 percent recycled paper." "No trees are harmed to make Paper Culture invitations, they have free designer services, free address printing, and they plant a tree with every order. "..."Paper Culture will print and display them on beautiful bamboo Kubelets blocks that make a perfect desktop display. " "Cute and eco-friendly: That’s a combination we love, which is why we're excited about Paper Culture‘s new bamboo wall art collection." "It’s this love of trees that has driven Paper Culture to plant ... more than 350,000 of them in the U.S. and abroad." "Bold and modern wedding invitation." "No need to feel guilty about sending paper cards instead of digital with Paper Culture; they actually plant a tree with every order." "get this, because you're so busy as an expectant mom, they will stamp, address and mail your invitations for you"
With "Paper Culture, the need to look perfect in a single holiday photo has been multiplied several times over"
"This stationery company plants a tree with every order, even custom address labels." "These stickers are for you: the gift-giver, the holiday card-sender." "Make your sis feel special with this personalized [Paper Culture] stationary—we love the fun vibe the thought bubble gives off." 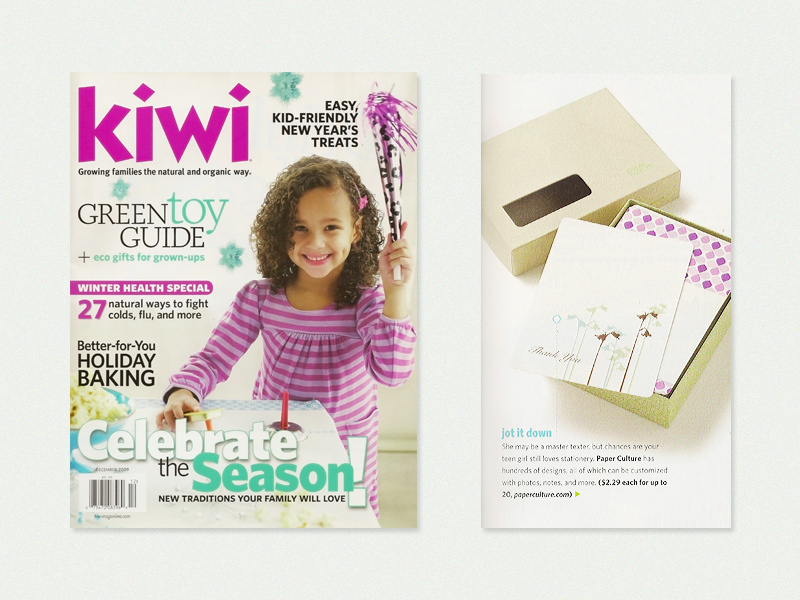 "Plant a tree by buying your party invites from Paper Culture, an eco-chic stationery company." 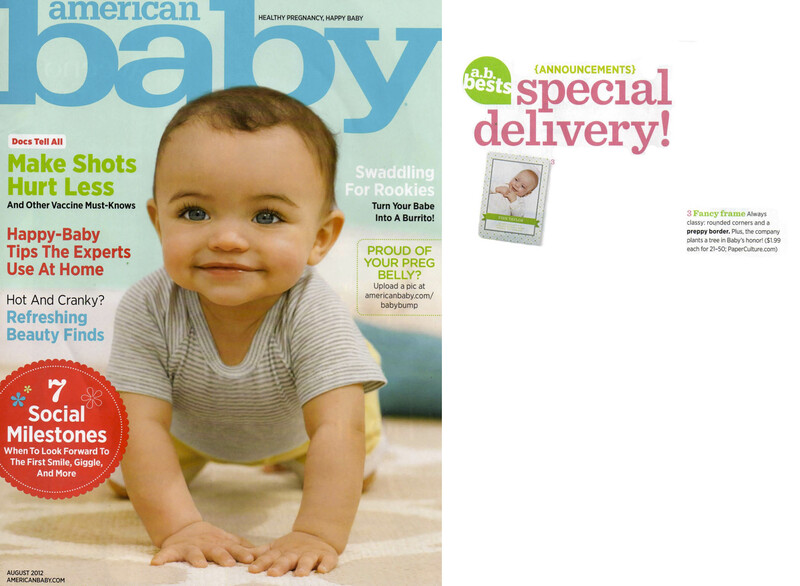 "Always classy rounded corners ... Plus, the company plants a tree in Baby's honor!" "Hang eye-catching, earth-friendly art [from] Paper Culture"
"Paper Culture has designed the ultimate eco wall art that's perfect for any room including your baby's nursery or child's playroom." "Announce the newest member of your family with these graphic, modern and unique cards"
"Number of trees planted by card company Paper Culture, which plants one for every order it receives"
We are big fans of Paper Culture ... they have come up with a perfect solution ... printing beautiful rich photos on bamboo! "We love [the Faces of Stationery Set], it would be fun for all ages. And so good for thank you notes too." 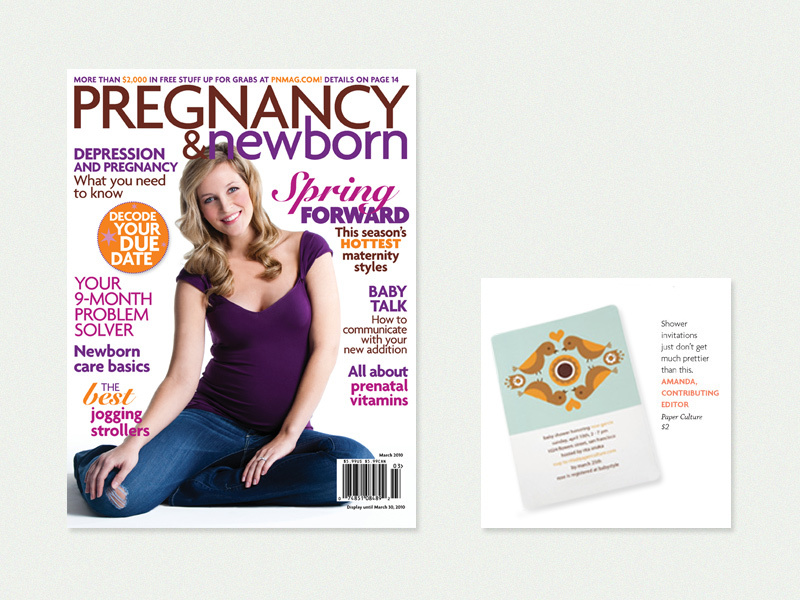 chosen as a "favorite online eco-friendly retailer"
Virtual Shopping List profile of the "eco centric, carbon-free paperculture"
"Not only are their baby announcements unique and modern, but the design options are endless." "the bugaboo of the stationery world"
"We came across an amazing array of birth announcements during our search, but it was a no-brainer to hail Paper Culture as our top pick." "the cards themselves are gorgeous: thick, heavy paper stock, made entirely of post-consumer waste, with rounded corners and magnificently clear images"
"[Paper Culture] is a mod, mod world of greetings"
Paper Culture has … designs … which can be customized with photos, notes, and more." 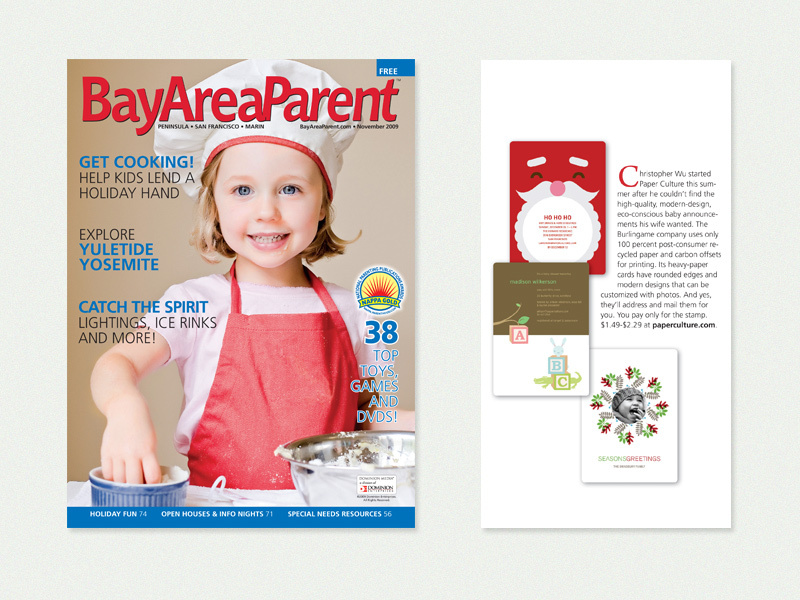 "stylish greetings … good for the planet … and impressively designed"
"Paper Culture is our pick for the online card company that has the trendiest modern baby stationery and holiday photo cards around." "Not only does [Paper Culture] utilize a host of environmentally thoughtful production practices [but they also] donate a portion of all proceeds to charitable organizations." "Holiday Hellos: Stylish and Convenient Cards"
"All of their designs are as fresh and modern as their company ethos and services." "After discovering Paper Culture, I feel like I've died and gone to MODERN stationery heaven!" "Thoroughly modern and simply mahvelous." "Paper Culture is officially my favorite stationery store ... I was amazed with both the beauty and quality of the products"
"loving their fresh, modern approach to stationery design … their focus is not only on bold, colorful designs and modern typography but the environment, as well." "I was thrilled to break open the package and find adorable cards from an extensive collection." 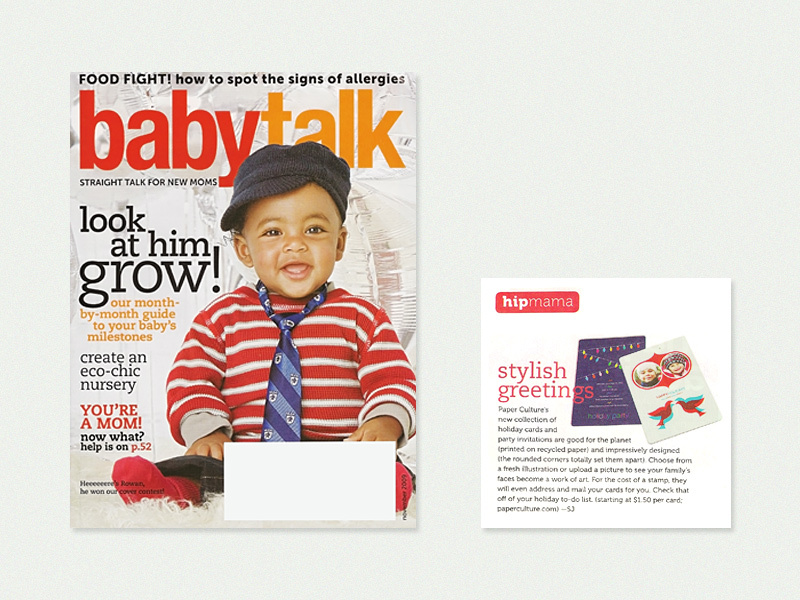 "[Paper Culture] offers a “mail & message” service ... a great time-saver for new parents." "they're all about clean lines, fresh typography"